Are your products shelved in a categories? Is there ample space between competing brands? How does the shelving system offer the required contrast to bring the drug packaging to light hence attention? Have you employed any systems to appreciate that? If you needed more information of a particular product category, is there a summary for the products category available? Does your usage of space on and around your shelving allow for this? 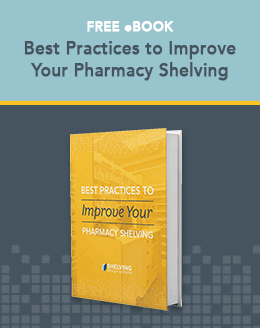 To instill such sentiments, your display and shelving is once again in the center of the challenge, you need to ensure that the system you use appreciates the constraints that will bring out this appeal in a modern pharmacy design. 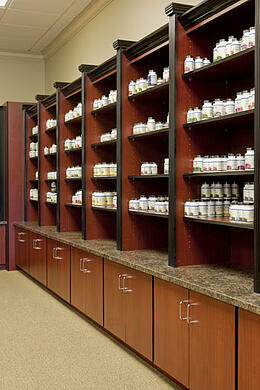 Using innovative display and shelving products, you can utilize small spaces to appear uncluttered and organized. This is in appreciation of the wide variety of products covered by your establishment, where the increase in competitive brands is slowly cluttering your designs, you cannot possibly cram in another line of products. A poorly organized shelf system will reduce the required attention from your customers, leading to reduced sales. A concern for all drug stores is the ability to protect controlled products in a way that does not impede your customers from interacting with them, it seems like meeting both needs may not be possible, but granted an innovative system that instills both attributes, your sales of controlled products may just double. Regional regulation would demand that you maintain control of the distribution of such products, and the secret lies in the display and shelving system that will give you the best of both worlds in a modern pharmacy design. Fresh eyes on your establishment will consider all the factors and constraints you need to meet in achieving all your objectives. You need to remember that while you understand your industry completely, you cannot fathom your customer's behavior patterns that affect your sales. You need to keep your focus on meeting their needs other than appearing like a commercial entity. You need a professional consult on the appeal of your establishment, that will encompass a modern pharmacy design that meets all the mentioned constraints.